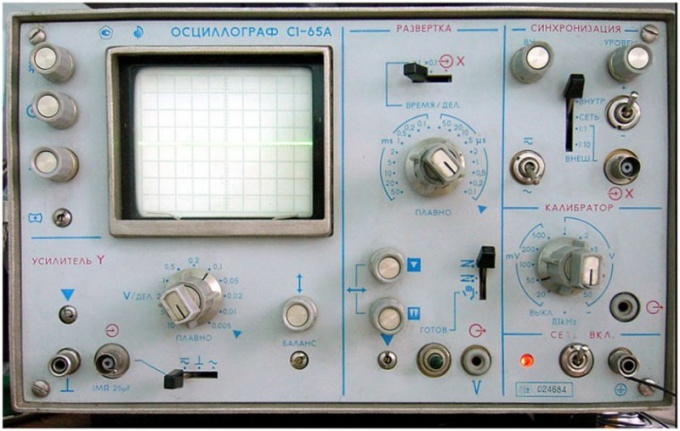 Oscilloscope - a device that visually displays electrical oscillations. Its name comes from the Latin and Greek words – "Oslo" and "grafo", which means "rock" and "write" that accurately reflects the principle of its operation. The first oscilloscope was invented in France in 1893 by the physicist andré Blondel and was more primitive and less precise than its modern variations. Today's oscilloscopes provide an opportunity to explore the signals gigagertsevyj frequencies. To explore more high-frequency signals typically use a more complicated electron-optical camera. On the purpose and behavior oscilloscopes are divided into two types. The first are the periodic scan for direct observation of the waveform on the screen. Second, having all of the same continuous scan, register the oscillation curve on the photoblog. The oscilloscope with the periodic scan is divided into universal, high-speed, stroboscopic, memory and special. Digital gives the opportunity to combine the use of various functions. It is also customary to distinguish between the oscilloscope according to the method of processing the input signal on analogue and digital. There are also classifications according to the number of beams: single beam, two-beam etc. the Number of rays can reach 16 or more. In addition to these variations there are oscilloscopes, combined with other measuring devices. They are called scopometer. As mentioned above, the oscilloscope is a device to study the amplitude and time parameters of an electrical signal. That's why oscilloscopes found a wide use in electronics and radio engineering, where they are used for more precise diagnosis and understanding of oscillatory processes in the electronic circuits. With the help of this device it is possible to estimate not only the oscillation frequency, how much the shape and pattern of oscillatory processes. Also with the help of an oscilloscope it is possible to find the interference or distortion of the pass of the electric pulse in different nodes of the diagram. Today it is one of the most important devices in electronics. It is used in applied laboratory research purposes, for monitoring and study of electrical signals. Use the oscilloscope found and in television broadcasting. In this field it is used for periodic and operational control of quality indicators of the television system and its individual links. The traces of the oscilloscope left in the gaming industry. It was his screen served as a display for one of the first video game Tennis For Two. It was a virtual version of tennis.